This week I spent five days at Jewelry Studies International with Ronda Coryell, studying chasing and repousse. Chasing is the process of using hammered tools to depress a sheet of metal from the front, while repousse is the same process from the back. Usually, the sheet of metal is mounted in a pot of pitch to support the work, with the back side facing up for the first pass. 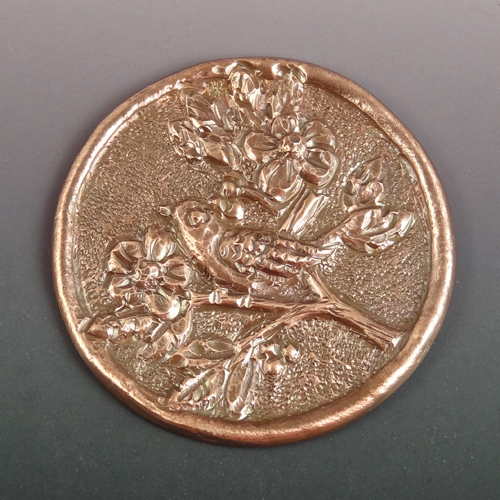 Repousse is used to give the general shape of the piece, moving metal down into the pitch that will be raised on the front. Then the piece is flipped to add detail via chasing from the front. The trick is to think in reverse. Deeper is higher. Things in front must be deeper. Depth of field is created by varying the depth, so a leaf coming out of the plane of the metal protrudes more at the tip than at the base. After years of doing double sided work and carving molds for glass casting and reverse-paintings on glass, this reverse thinking is fun for me, although sometimes it takes some tweaking. It's a good version of "negative thinking." Our first day was spent getting a feel for mounting and unmounting the metal in the pitch pot, learning how to hold tools and hammer properly, experimenting with the various tools, and exploring that negative space. 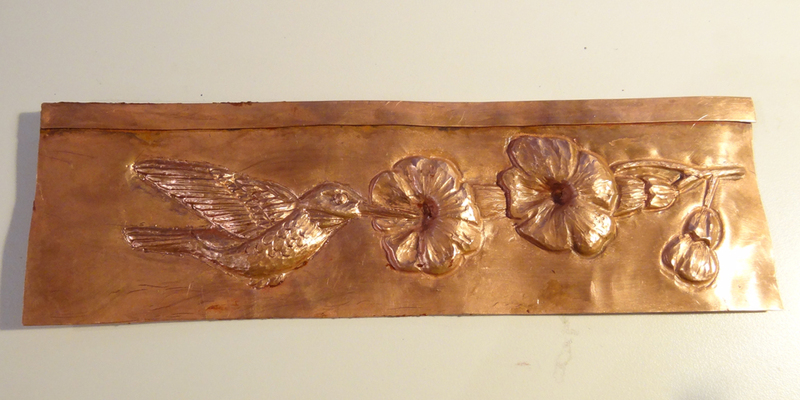 After filling a 4" square of copper with a variety of marks, we were supposed to start on a flower and leaf medallion. Since I want to make jewelry rather than larger metal pieces, I started small, with a 1.5" diameter circle with a motif similar to my usual work. It didn't take me long to realize that the tools provided were too large, but Ronda rescued me with a few of her handmade collection. Working with magnification, it took me longer to complete this piece than for others to do the 3" diameter exercise. It took me a full day of work to complete the small piece. One of the more valuable parts of the class was learning to make our own chasing tools from water-hardened tool steel. Several classmates had purchased expensive sets of chasing tools from reputable suppliers that were totally unusable as supplied. They learned to reshape and polish those tools. I made five chasing tools over several days, as I had waiting time to fill, and plan to continue with a large collection. Ronda has a caddy with probably thirty different compartments, each filled with a collection of eight sizes of a give shape or texture! What an investment! I decided to simplify and work larger for the next project. 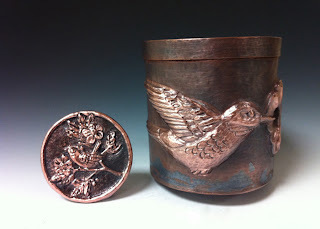 Ronda offered to teach us how to make a cup to hold our chasing tools, which seemed like a great project, as I've never worked with anything that large. So I drew out a simple hummingbird and trumpet flowers, which turned into a much larger project. 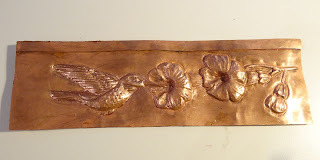 I realized after doing the repousse that I had the flowers looking very flat rather than tipped, so I had to totally rebuild them by sinking the centers dramatically and raising the front areas more. 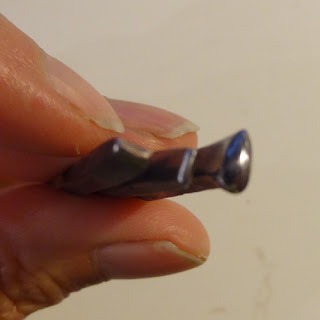 In the process I learned to trust that voice in my head that says "the metal is too hard; you need to remove it from the pitch and anneal" as I put tiny tears into those over-depressed centers. A learning process, to be sure. After many, many hours of work, I formed the piece into a cup and soldered a large piece for the first time, making a mess of the seam to the bottom, but also learning how to deal with recalcitrant seams. Once trimmed, darkened and polished to bring out the highlights, I have some useful tools to remind me of a fantastic class. If you ever have the chance to take this class, jump at it! You did a fabulous job! Amazing that this is your first go at it!! Funny how past work can be just the prep for new things! ooooh fantastic, both of your pieces are wonderful. 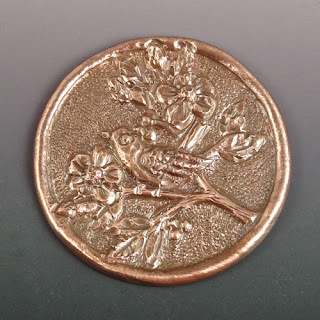 We are about to learn Chasing and Repousse in the coming weeks at College and it's a technique I'm very much looking forward to learning. It's nice to hear from some one who has done it, this now gives me an idea of the work involved. Thanks, Lynsey! 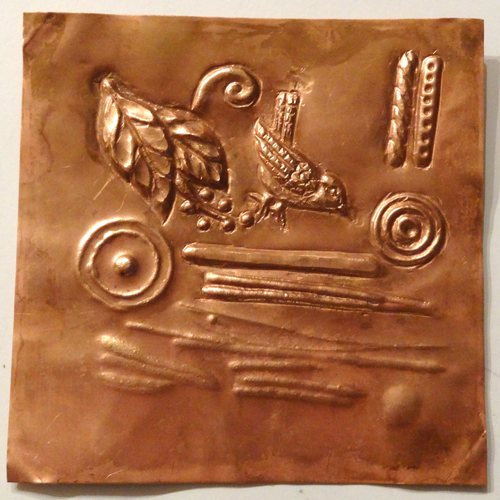 Everybody in our class loved chasing and repousse, and everybody did totally different work. I'm sure it will be a treat for you.